David Plastik, with a somewhat predictable nickname of “C4,” is a famous poker player who has had a very interesting life. Born January 22, 1964, David was interested in music from an early age, but couldn’t play the guitar because he was left-handed and everyone wanted to teach him how to play right-handed. After failing to learn the instrument, David started going to rock concerts while bringing along a camera, and his career as a freelance photographer was born. For the next decade, David Plastik took pictures and sold them to whoever would buy them, including Rolling Stone and several other big-name publications. He got into the partying scene as well, and was introduced to many famous names all the while doing the booze and drugs inherent at such parties. Wanting to straighten his life out, he took a job at the family business and spent the next decade of his life as a fabric salesman. While working as a fabric salesman, David Plastik started playing at the nearby Commerce Casino, and found out that he had some skill in poker. 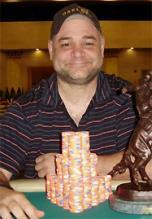 He started playing poker tournaments in 1997 after discovering the thrill of the competitive poker tournament play. He invested a lot of his winnings into high-tech stocks, but lost his money when those stocks plummeted in 2000. David Plastik lost his house and most of his money, but thanks to his poker skills he was able to land on his feet. David Plastik is yet to win a World Series of Poker or World Poker Tour event, but that is his next goal. He did come in 3rd in the 2004 $2000 HORSE event, where the winner was the legendary Doyle Brunson. David Plastik likes to travel around the poker world and see all the exotic locations where one can play poker. He now lives in Las Vegas, Nevada.